Using Rootit Rooting Gel couldn’t be easier, unlike other rooting compounds, whereby the cutting is coated with the gel before being transplanted, Rootit Rooting Gel is applied directly to the pre-made hole in the propagation plug, or if in a soil medium, make a small hole big enough for the cutting and fill with the Rooting Gel. Once the cutting is placed into the plug or medium, a seal is formed around the cut surface, this helps prevent the fresh cutting becoming dehydrated, along with increasing its resistance to infection and helping with the absorption of any available food. 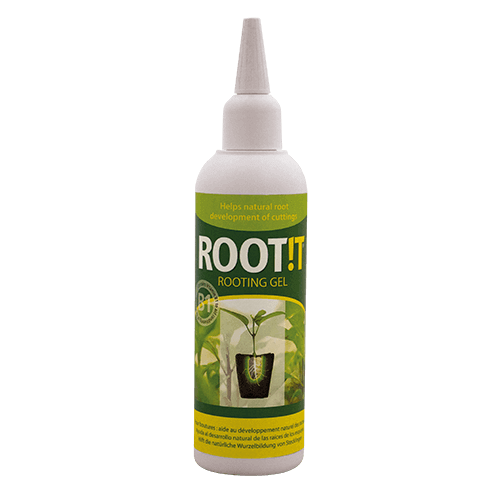 Rootit Rooting Gel helps speed up the first signs of root development, and continues to aid the cutting into developing an abundance of faster growing and healthy roots, until the seedling is established before moving it on to the vegetative stage of the plant life cycle. The success rate of using Rootit Rooting Gel is high, but only if the plugs or medium stay moist and that the environment maintains optimum temperature and humidity levels to encourage root growth and development.